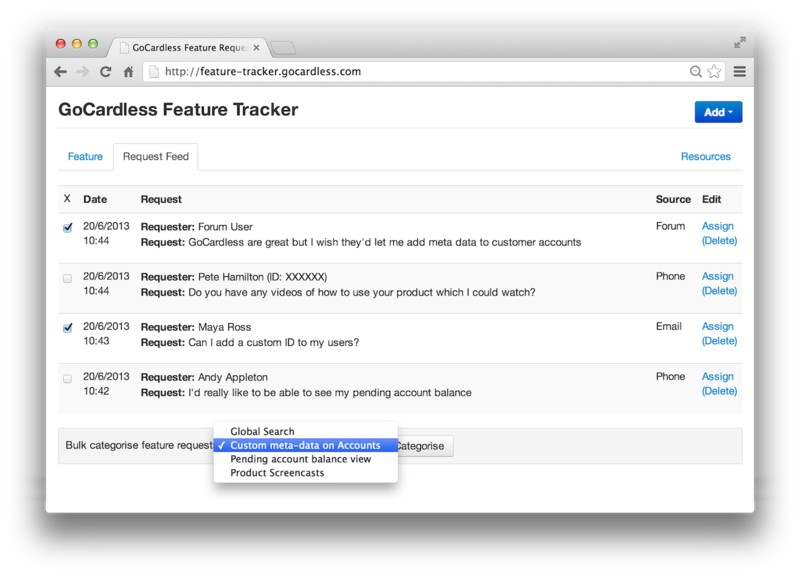 Take 1000s of payments at once - upload a CSV to request payments from all your customers at once (read more). Easily identify customers - you can now add custom references and company names to your customers (read more). Know when you will be paid - simply click on a payment to see the exact payout date (read more). Cancel payments - cancel via your dashboard, right until we submit the payment to the bank. Don't forget to follow our Twitter to be the first to find out about new GoCardless features! What's the most ridiculous reason a customer has given you for not paying on time? Let us know and we'll feature the best responses. Since day one, GoCardless has been trying to build something businesses desperately want: a simple, easy, low-cost way to accept Direct Debit online. Scaling brings problems. Thousands of business are now using us. It's easy to listen to your customers when you only have a dozen, but how do you collect and organize feedback when there are thousands of them? Enter technology. To solve this, we built a nifty feedback tool: it enables us to collect every piece of feedback we receive no matter where it is, collate it in one place and share it with the team. Great options already exist for collating feedback from a single channel (Get Satisfaction and User Voice are two of our favourites), but nothing really helped us collect feedback across different channels. In a typical day, we'll get feedback through emails, feedback forms, phone calls, forums, in the pub and everywhere in between. So we decided to build our own solution. We started by linking up the feedback box on the new GoCardless Dashboard, an easy win allowing us to record feedback and customer information directly from within our app - this is a goldmine for feature suggestions. We then updated our phone call tracking system, Nodephone, to include a feature request field, making it simple to track feedback and link it to specific phone conversations. What about feedback we receive in forums? In emails? Twitter? Facebook? Fleeting moments of genius from a team member on a caffeine-induced high? All of these happen in a browser (or at least in close proximity to one), so we went ahead and built a Chrome extension. The extension enables us to select any piece of text, right click, and instantly log that feedback right there and then. It’s that simple. After being tested by some brave volunteers, we launched to the whole team later that afternoon. We feed all of the information into a simple Rails app hosted on Heroku. With the new tool, feedback rapidly accumulated. Our next challenge was turning thousands of unstructured textual feedback snippets into an actionable, prioritised list that could drive development. The primary challenges here are cataloging the feedback and then ensuring it gets seen by the right people. Rather than expecting everyone to look at every piece of feedback, someone from the Customer Support team blitzes through all submitted feedback each week and makes sure it’s tagged for the appropriate features and products. This gets automatically compiled into a summary which outlines the top requested features and areas for improvement that week, comparing it to all-time demand. The feature tool now sits at the centre of any dev-prioritisation meetings, allowing the most requested features to naturally shift towards the top of our roadmap. This helps to focus discussions, and back up our intuition with some hard data. On top of this, we can go into the tool and dig in past the summary to see exactly what our users have been saying. We firmly believe every member of the team should understand our customers' needs, so every team member has access to the app to read feedback and add comments. We encourage this behaviour with an automatic summary email each day outlining the previous day’s feedback, enabling people to quickly spot potential issues and tackle them early. Building the feedback tool might have taken a day of our time, but the business application was clear and it's had immediate effect.